Opposing coaches have thrown everything but the Zamboni at Eden Prairie senior Kyle Rau, and all those exotic schemes have failed to achieve even marginal success. So if the best strategy is to treat Rau as just another player, well, turns out that didn’t work for Eagan, either. “No,” Wildcats coach Mike Taylor said after a long pause when asked if he had implemented anything special in his game plan in an attempt to slow the Mr. Hockey candidate. 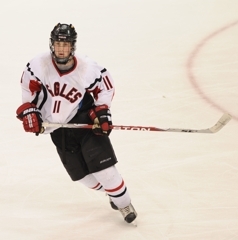 Rau has four goals in the Eagles two state tournament games and an even 40 this season. Rau scored on a back-door tap-in on a power play 22 seconds into the second period to put Eden Prairie ahead 3-0. Just more than three minutes later the Eagles led 4-0, courtesy of a Rau one-timer from just outside the crease. Luc Gerdes and Nick Seeler scored in the first period for Eden Prairie, and Ben Boldenow added a goal in the third. No. 1-seeded Eden Prairie (22-5-2) plays No. 3 Duluth East (23-5-0) at 7 p.m. on Saturday. 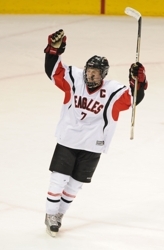 One of 10 Mr. Hockey finalists, Rau, a University of Minnesota recruit, is Eden Prairie’s all-time scoring leader. As a sophomore, he was a key member of the Eagles’ state championship team. “It’s just a normal thing, actually,” Seeler said about Rau’s state tournament scoring exploits. “The whole season he’s been doing that. Rau led the Eagles with seven shots, blocked two shots, won 17 of 28 face offs and even was credited with a quality hit. 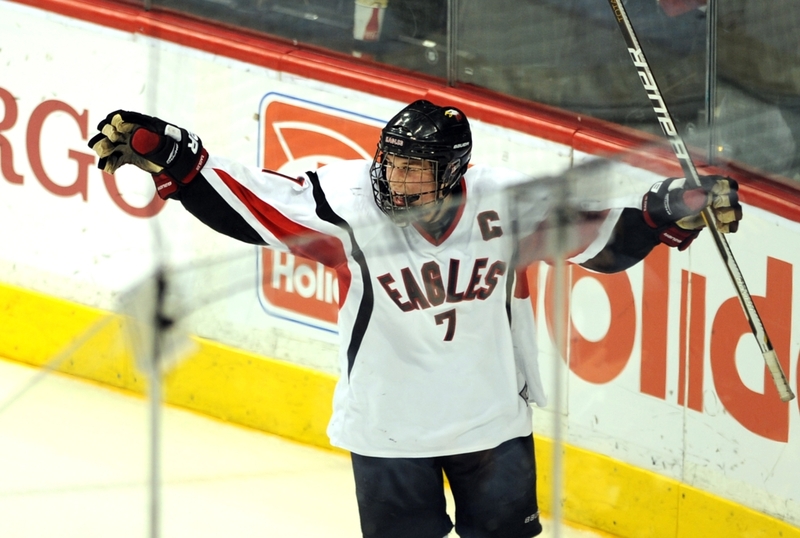 That came late in the game when Eden Prairie had iced the victory. One stat that isn’t tracked is penalties drawn. Rau took a stick in the facemask from Eagan’s Will Merchant early in the third period in what has become a familiar scene. Rau has drawn at least one penalty in each of Eden Prairie’s last four games, dating back to a Section 6AA semifinal win over Minnetonka. “At least two a game, probably,” Eden Prairie coach Lee Smith said when asked to estimate how many penalties Rau has drawn this year. Smith said sticking a player on Rau is a failed strategy not because of Rau’s rink savvy. Eden Prairie's Kyle Rau (7) waits for his teammates to celebrate one of his two goals Friday night (Photo by Helen Nelson). Eden Prairie has played 30 games this season, the biggest being No. 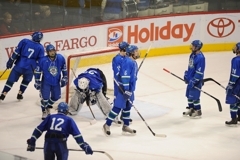 31 on Saturday, March 12, against Duluth East in the state Class 2A semifinals at the Xcel Energy Center in St. Paul. Goals have been scored on a regular basis by Mr. Hockey finalist Kyle Rau, who has four goals in two state tournament games and 40 this season. At the other end of Eden Prairie’s scoring spectrum sits Ben Boldenow. When Eden Prairie had a 4-1 lead late in its semifinal game against Eagan, Boldenow, searching for his first goal of the season, got a chance on an Eagles power play late in the third period. Sitting near the right post, Boldenow made the most of his opportunity and scored his first of the year on the grandest stage of Minnesota high school hockey. Finding a way to get Boldenow on the score sheet has been something of a project for most of the Eagles’ players. Throughout the latter stages of the season his teammates have given him a hard time, in good fun, about not having a goal. So finding a way to get the senior’s name called over the public address system was on the Eagles’ minds. Boldenow went through the goal-scoring line of fist bumps, went to the bench with a huge smile on his face that could be seen through his facemask on Xcel scoreboard’s big screen. In a picture-perfect moment, Boldenow was flipped the puck he used to tally the Eagles’ final goal in their 5-1 victory over the Wildcats. “Ben’s been tenacious and done everything we have asked him all year, just hasn’t had the luck,” Eden Prairie coach Lee Smith said. “To see him finally get one and probably have that pressure off his back. If his classmates don’t believe what it says on the scoresheet, he can always bring the puck for proof. On a mission to redeem their regular-season loss to Eagan and given the chance on a big stage, the Eagles won Friday’s rematch 5-1 to put themselves in contention for a second state title in three seasons. No. 1 seed Eden Prairie advances to meet No. 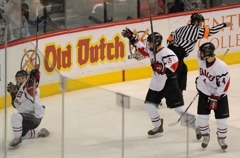 3 seed Duluth East in the championship game at 7 p.m. Saturday at Xcel Energy Center. Eden Prairie once again will be looking to even the score. 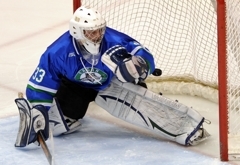 The Greyhounds beat the Eagles 4-3 in overtime on Jan. 15. 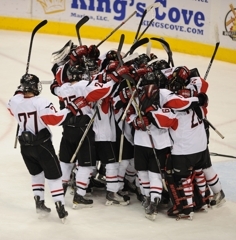 Coincidentally, Duluth East advanced to Saturday’s championship game on three consecutive overtime victories. Eden Prairie took control early against Eagan, building a 2-0 lead in the first period. First, Luc Gerdes sent a pass to Mark Rath along the back wall and got the puck back to complete the give-and-go with a goal at 8:47 for a 1-0 lead. Defenseman Nick Seeler struck next, throwing a puck through traffic that wound up behind Eagan goaltender Tommy Bodeker for a power-play goal at 13:02. 4-0 Eagles lead through two periods. The first of Rau’s two goals came on a power play. The Eagles were 2-for-4 with the man advantage through two periods, an improvement over the regular-season game that saw the teams go a combined 0-for-12 on power plays. Rau’s first goal was a tap-in on the back door, set up by deft passing from Seeler to David Rath to Rau. 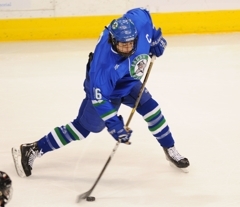 The second goal started with a drop pass from Des Shavlik, who was skating around the back of the Eagan net. Rau, with a defender in his face, sent the puck just inside the far post. Speaking after their respective quarterfinal games on Thursday, coaches and players from Eden Prairie and Eagan stressed playing sound defense. 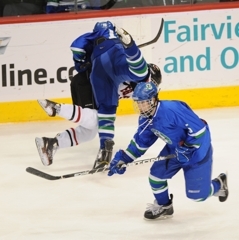 But only the Eagles were able to properly execute, holding Eagan to only 10 shots through two periods. 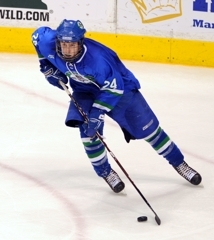 Eagan’s Derick Kuchera finally put his team on the board with a backhand shot for a goal at 1:38 of the third period. All he does is make plays. 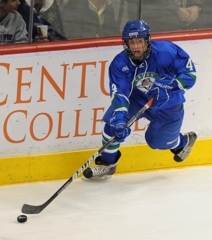 The senior Mr. Hockey favorite continued his impressive romp through the state tournament, scoring two goals and adding two assists in a 5-1 victory over Eagan. Rau also drew a penalty and anchored the Eagles' power play, which went 3-for-7 in the game. He tallied nine shots on goal, almost a third of the Eagles' 34 total shots. Often overshadowed by his linemates, Rath stepped to the forefront Friday night with assists on the Eagles' first two power play goals. His physical play was apparent, as Rath led the Eagles' with six hits. He also drew a penalty on a breakaway attempt, as he was hooked and tripped from behind while streaking in on Eagan goaltender Tommy Bodeker. Gerdes got the Eagles on the board early, finishing off a pretty passing play from Mark Rath just 8 minutes, 47 seconds inot the game. It was the opening salvo in a five-goal Eden Prairie blitz.